Morphing mammals, dismembered body parts, and reimagined classical figures stand in unexpected locations throughout the historic center of Lucca, Italy. They are part of an exhibit entitled: Il passo sospeso ~ Esplorazione del limite or The Suspended Step ~ An Exploration of Limits. The bronze works of over 40 international artists are featured among Lucca’s famed, park-topped Renaissance walls, and they make touring historical sites thought-provoking and even fun. The show’s contemporary works, sponsored by the Fondazione Ragghianti of Lucca, explore the timely concepts of boundaries, borders, and limits, by forming connections between the sculptures and their positioning throughout town. Figure 1: Gustavo Aceves, “Lapidarium.” On the rampart of San Paolino, Lucca. Photograph by Grace Roberti. At the city’s principal gate, San Paolino, those who enter through it may feel threatened by the 30-foot tall equestrian guard on the rampart above them (Figure 1). After a glance around the city, he is not alone: Congo warriors and horses in various stages of disintegration fill the 16th century military staging area just behind him (Figure 2). Little boys shout in glee to see the swords, parents of all nationalities read about Gustavo Aceves’ work Lapidarium, and locals gaze approvingly on what appears to be preparations for some apocalyptic battle. For Aceves, this is a “work in progress [that] will grow with each installation until its final exhibition.” He intends each bronze work to represent a fragment of human history, creating a silent space of reflection available to all. From Lucca, the Lapidarium (previously in Rome’s Imperial Forum) will travel to Athen’s Acropolis, il Trocadero in Paris, Beijing, and finally, Mexico City, where Aceves plans to show 100 unique large scale sculptures. Figure 2: Gustavo Aceves, “Lapidarium.” On the rampart of San Paolino, Lucca. Photograph by Grace Roberti. Inside the ring of its park-lined walls, Lucca’s 9th century church of San Michele is an important destination for visitors because of its ornately decorated façade featuring the sculpted heads of important leaders from over the centuries. One can imagine them judging the merchants cutting deals in the piazza below, which was once the city’s Roman forum and chief marketplace. Now neo-expressionist Sandro Chia has positioned his sculpture, Offerta d’amore or “Love Offering” there. It features two 17th century-like figures passionately discussing a love offering, where farmers once came to sell their crops (Figure 3). Chia is a Florentine painter and sculptor with works on display at MOMA and the Tate Gallery. Figure 3: A new type of bartering. Sandro Chia, “Offerta d’amore.” Piazza San Michele. Photo by Grace Roberti. From here, a visitor would traditionally walk up the via Fillungo, the original Roman road leading out of town to the countryside. The ancient road is usually crowded with locals on their passeggiata, admiring one another and the fashionable shops that line the street. So, after a brief walk, it is a pleasant surprise for visitors to escape through a tunneled archway and discover an oval-shaped piazza, once a Roman amphitheater. Surprising even to Lucchesi is the sight of Tindaro in the center of the restaurant-ringed piazza. The sculpture, a towering bronze head in a neo-classic style by Igor Mitoraj (Figure 4), seems to dignify the setting of the ancient Roman amphitheater, soberly reminding tourists that in the past, the venue was hardly a dining destination. Mitoraj, who died in 2014, is well known in Lucca for his adoption of nearby Pietrasanta as his artistic home. Like Michelangelo and Henry Moore before him, the Polish-born sculptor appreciated the quality of its Carrara marble and set up a studio there. Figure 4: Igor Mitoraj, “Tindaro.” Reminding visitors that Lucca’s Piazza dell’anfiteatro is oval-shaped, thanks to the Roman amphitheater that once stood there. Photo by Grace Roberti. Many visitors to Lucca wisely rent bikes to ride around the top of the city’s walls to admire the views, and now they can also enjoy other artworks on exhibit there. Atop the elegant structure of Porta Elisa, an entrance and exit gate through the city wall, male and female figures Ikaro Alato and Ikaria also by Igor Mitoraj (Figure 5) seem ready to attempt another winged escape from earth. Figure 5: Igor Mitoraj’s “Ikaria and Ikario Alato” appear ready to take off from the wall’s Port’Elisa. Photo by Grace Roberti. Further along the walls, one can admire works by Greek sculptor Sophia Vari: L’homme and La femme (Figure 6). These intentionally appear on a 17th century rampart scarred by the remnants of a 16th century defensive tower which sits alongside a barracks still in use today. The artist was attracted by the stratification of so many time periods within the space, a stratification akin to her use of polychrome sculpture. Figure 6: Sophia Vari, “L’homme and La femme.” Mari create parallels between the statues’ construction and the stratification of rampart. Photo by Grace Roberti. Other works seem to spring impromptu from forgotten spaces and galleries throughout the city, giving one pause, as the shows title suggests, to consider the possibilities life offers. 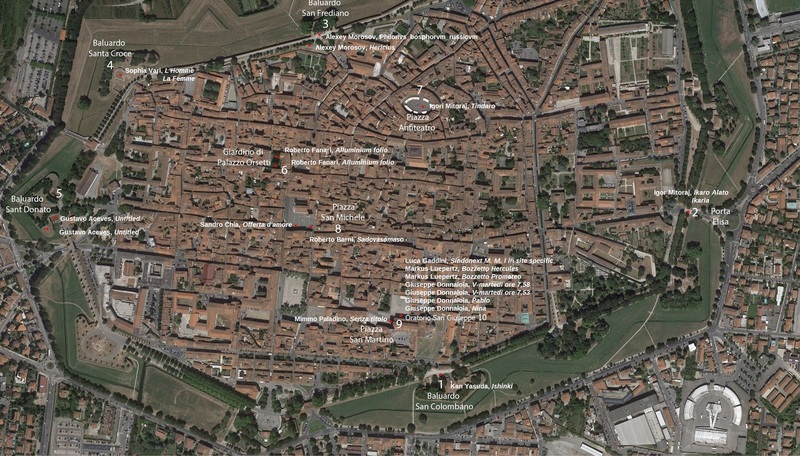 Artworks are displayed at the Fondazione Ragghianti, and other locations as shown on the foundation’s map. Alessandro Romanini curated Il passo sospeso to celebrate the 30th anniversary of the passing of the foundation’s founder, Carlo Ludovico Ragghianti, who educated present and future generations about 20th century art by exposing them to the perspectives of international artists. The show opened on June 23, and runs through September 3, 2017. It is free to the public. © 2019 Los Angeles Review of Books. All rights reserved.